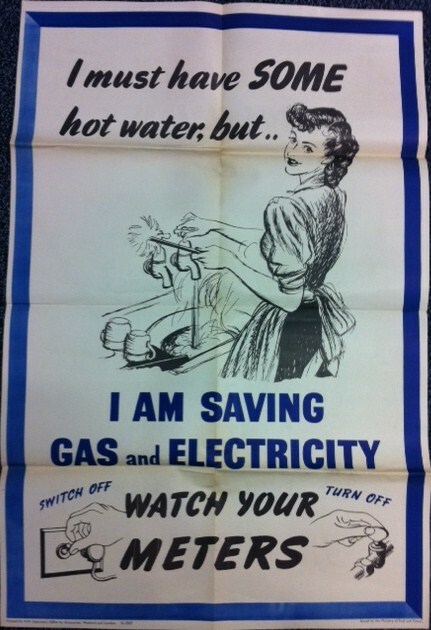 This gem of a poster ‘Watch your Meters’ turned up in three folders of material I’m cataloguing entitled ‘Effect of war on civil and social life (including children and fuel)’. There are 6 posters in total but this one in particular jumped out at me, due to its design and colour scheme. Then I noticed it is the only one with a named artist, Reginald Mount. There is more information about Reginald Mount here, part of a National Archives online exhibition – ‘The Art of War’. Poster from NUWT Collection, ref UWT/D/268/1 Image (c) Crown copyright. Image may be used only for purposes of research, private study or education. Reginald Mount had worked in the advertising industry in the 1930s as a designer and joined the Ministry of Information at the outbreak of the Second World War. The National Archives page shows many more posters designed by Reginald Mount, the one of ‘five male profiles’ with the reference, as noted by the National Archives, to Soviet designed posters of the time, is particularly interesting. I also love this poster he designed for The Ladykillers. 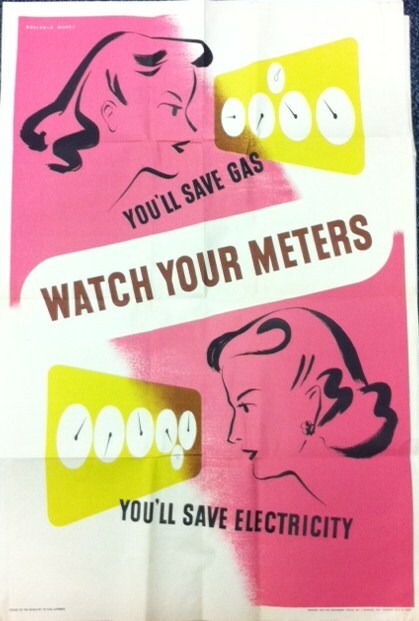 There is also another series of posters along the same lines – each one with a different coloured border and a different image but all part of the ‘Watch Your Meter’ campaign. None of the other ones (like this image below) have artists named on the posters though. 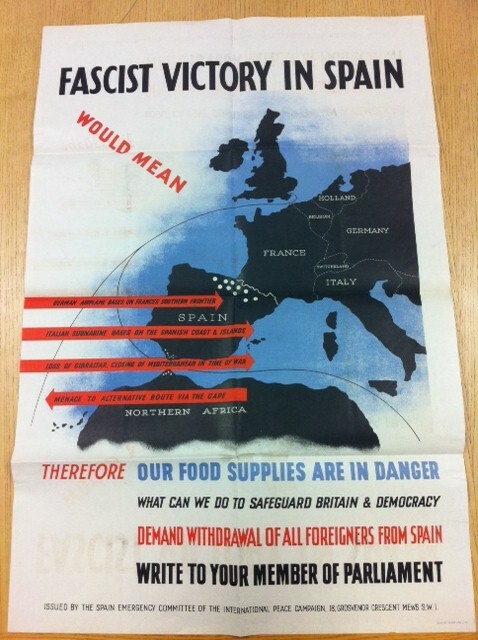 I was just after saying to someone the other day that I was quite surprised there wasn’t more material on the Spanish Civil War in the NUWT Collection when I came across this poster and associated correspondence. This poster was in a box of correspondence between the NUWT and the International Peace Campaign (IPC). The letter that this poster was attached to, dated 03/03/1939, explains that this is a draft of a poster which they submitted to the British Poster Advertising Association for approval. They replied that “they would not be able to recommend members of the Association to exhibit posters of a similar nature to the draft submitted to them”. At that time the British Poster Advertising Association controlled 90% of UK bill posting companies this pretty much amounted to a countrywide ban on these posters. The IPC felt this was basically censorship of their right to disagree with the Government policy of non-intervention and they urged all supporting organisations to display this poster wherever they could. They would supply as many copies as needed free of charge and asked the NUWT to distribute it as much as they could. Unfortunately there is no reply so I don’t know how the NUWT responded to this or if they requested more posters. The more I read about the British policy of non-intervention in Spain the more incredulous and angry I get about the whole thing. Maybe there will be more Spanish Civil War material to come in the NUWT Collection, I hope so! As I mentioned in my last post I found a good deal more correspondence between Giovanna Guzzeloni and Muriel Pierotti. Unlike the last find though there weren’t in a folder marked ‘International’, instead they were in folders of correspondence between Central Council and the Lincoln branch of the NUWT. I apologise in advance for the length of this post but I thought all the information was of value and interest so I didn’t want to cut it short. The first letter from Giovanna is sent from Lincoln on 22/02/1943 where she writes “I am very much looking forward to attending the Easter conference as a delegate as I think the programme both interesting and of vital importance“. There are some standard letters back and forth regarding ordering stationery for the branch, nominations for central council and other administrative details. These go on through 1944 and in 1945 she is referred to by Muriel Pierotti as the Honorary Secretary of the Lincoln branch. 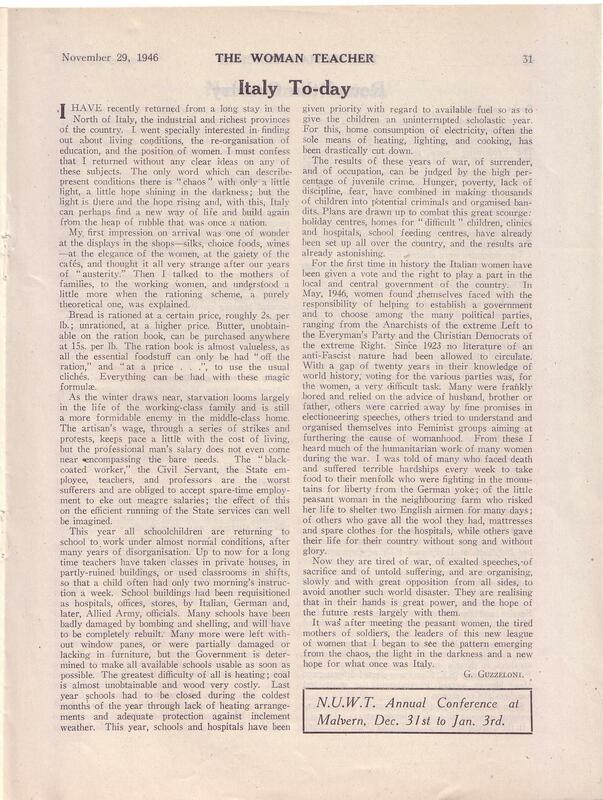 On 7th October 1946 Muriel Pierotti writes to Giovanna “I wonder how you fared in Italy this summer… I am sure the editor of the ‘Woman Teacher’ would be most grateful if you could send a brief article either on education or a women’s position in Italy today“. 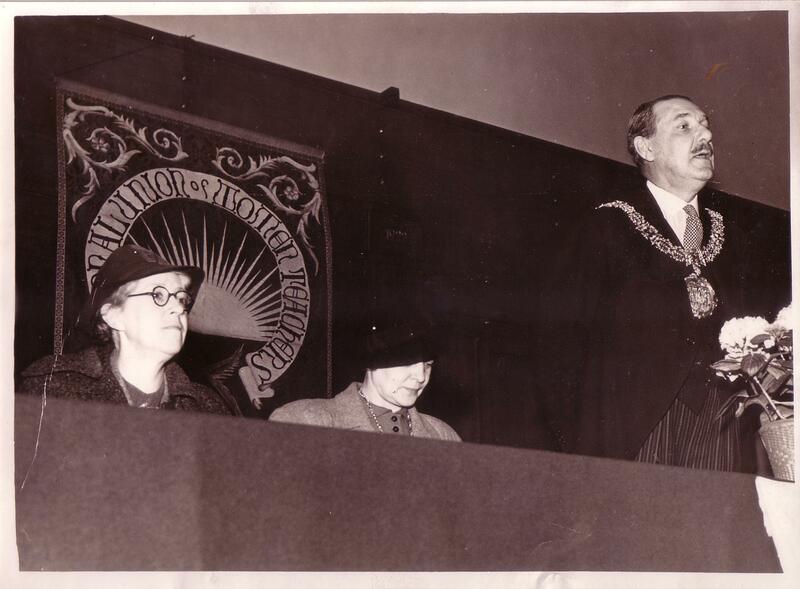 This then sent me off to check our run of the ‘The Woman Teacher’ – the journal of the NUWT – and I found that Giovanna had indeed written an article on 29 November 1946 called ‘Italy to-day’. I’ve included it below and although the text is small, and not OCR’d, if you click on it and enlarge then it should be readable. Muriel Pierotti replied on 22nd October thanking Giovanna for her account of the position of women in Italy and the state of education in the country. In a second letter to Giovanna which may be from Muriel Pierotti or from the editor of ‘The Woman Teacher’ she says “in this country it is hard to visualise the sheer terror that existed in the days of fascism and, before the war, it was difficult to get people to believe this existed… Do please, let me know if you find any way in which we can help the women’s movement in Italy for I, too, am very willing to help if possible.” This is referring to Giovanna’s memories of her mother’s experience in fascist Italy where she says that her mother’s name was posted on the Fascist Headquarters under the following notice “‘should anyone attempt the life of our Duce(?) twenty-eight heads will roll upon the village square, to be used as footballs’, this was not for any active work against the party but merely for a few unguarded words“. She returned to Lincoln in 1947 and there are some more administrative type letters between her and Muriel Pierotti regarding the running of the Lincoln branch. The next letter from Italy is dated 1948 but according to the Gianna Thompson website she was actually back in Italy in 1947 so her return to Lincoln bust have been a brief one! On 12 September 1948 she writes of the lack of educational facilities for nursery education, and the effects of the war “We are fighting to improve the conditions of Nursery schools all over Italy… with what means of transport we could muster up we went round finding suitable rooms where this work could be carried out. Looking for a couple of rooms in a village that had suffered almost 99% destruction was like looking for a needle in a haystack… the rooms were found and by April we had set up 25 nurseries in places as far up in the mountains as 3000ft. Places that had barely schools and where help was very scanty. Our girls have been more than splendid, facing the hardships they have to face in those places which lacked almost every necessity of a civilised life. I cannot imagine any male teacher putting up with the conditions as they did…. I think this perfectly illustrates the importance of cataloguing (if anyone still needs convincing of this!) as these are the kind of unexpected subjects and links between collections which would never have been found without detailed file level cataloguing. I’d like to thank Keith Washington for his incredibly useful and informative website as I feel I know her so much better now from all the added context given on his webpages.